I have finished my application and now need to handle adapting to multiple screen sizes. Have a seperate xml layout for: Small, Normal, Large and X-Large screen sizes. Have a seperate xml layout within that for: ldpi, mdpi, hdpi, and xhdpi Have a seperate xml layout within that for portrait and landscape. That is a total of 32 layouts for one activity. I am just wondering if there is a better way to do this as this would be very time consuming, however if it is required to support all the possible devices I would not mind it. I did some reading and people said to use Linear Layout and use gravity as that is a percentage so it will look the same on all screens. Or I could use RelativeLayout and use "AlignAbove or Below" etc. However my main problem is that the sizes are wrong, while the location of the elements seem to be generally in the right place. Is there a widely accepted way to do this? I am really just looking for what the "main stream" way that the average developer handles all screen sizes. Good question. But that way you are doing is not how a "professional" developer would do. You do not need 32 layouts for a single Activity, Android is intelligent enough to handle things. Without multi-definition of layouts/multi-definition of dimens.xml multi-device support possible or not? Yes, it is absolutely possible and this is what you should be doing. Defining 32 layouts for a single Activity layout is not a good thing. Suppose, I have a considerably large app in Play Store with more than 20 Activities, now if I had defined 32 layouts for a single Activity, then there would have been more than 600 layouts for my app. Is that feasible? Just ask yourself. You need to start by giving this page a very very good read. It contains almost everything you need to know. But I will help you get things right. This statement is enough to convince you that you should not be doing this. The Android system is intelligent enough to resize your layout accordingly. And trust me, its really good in that. I will try to point out some of the important things you need to consider. Always use dp or sp in your layouts. As the name suggests, they are independent of the density of different devices, so will look same in every device. Always provide different versions of your drawables for different screen sizes. This is something that you can't skip. If you do not do it, not only will your layout look awful in different devices but it will make your app consume unnecessary resources. Though a single layout will work great on tablets too, but as the screen sizes of tables are much larger than that of typical phones, you should provide separate layouts only for them. I am previewing a particular screen of my app in a variety of screen sizes all at once and my layout looks just as I wanted it to look, in all of them. I just have two layouts for this Activity, one for all the phones and one for all the tablets. If you want a practical experience, I have an app running on the Play Store which is used by thousands of users on more than 8000 different devices of different screen sizes. I only have 2 layouts for a particular Activity, one for the phones and one for the tablets. The UI of my app looks good in all devices and I never had a complaint about it from any user. In case if you need, here is the link to the app. I am sure this detailed answer could clarify all your doubts, if not, do not hesitate to let me know. I would love to help further. I would try to clear your confusion once again. But firstly I would RECOMMEND you to read my answer more than once. Either you need one layout or two, it all depends on the particular layout you are designing. All layouts are different from the other. It can't be defined technically as its subjective. There is no thumb rule for it. But I will try to help you formally. You need to make good use of the Android Studio Rich Layout Editor and its awesome live preview feature. 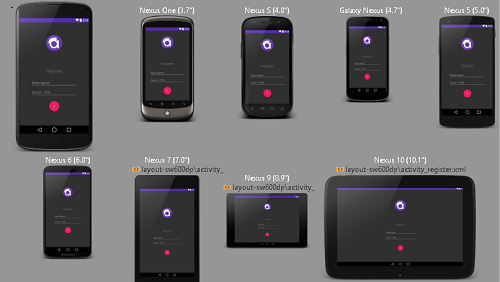 First try to design the layout targeting any average device size (like 5 inch of Nexus 5). Just choose Nexus 5 to preview your layout. Once you are satisfied with the design, select other screen sizes to preview them. You can also choose "Preview all sizes" like the screenshot above. Try to see if your layout looks good in all the screen sizes, varying from a 4 inch to a 10 inch tablet. See if the spacing's, image sizes, font sizes are all correct. All the phones ranging from 4 inch to 6 inch will generally have perfect previews, but you may need to design an another layout separately for the tablets screens (as they are large enough). Only here comes the need for 2 layouts, but not always. Like in my app, I have 2 separate layouts only for 5-6 activities, but for the rest I just have a single layout. It all depends on the particular layout. Designing is a whole lot different from programming. Programming can be defined formally and grammatically, but design can't be. Design is absolutely subjective and depends on the designers perspective. Be creative in your own way, that's the magic of design. Are you using dp and sp units correctly? i think its good to read documentation, they have explain each and every thing about support multiple screen. but everyone confuse HOW and WHEN we have to use that, m i right? Example: i have one Android which support for API 10-22 and all device start from(Galaxy star s5280- very small screen) to 10inch Tablet(Nexus 10). Note: Beginning with Android 3.2 (API level 13), these size groups are deprecated in favor of a new technique for managing screen sizes based on the available screen width. If you're developing for Android 3.2 and greater, see Declaring Tablet Layouts for Android 3.2 for more information. first read above guide lines, as per them we don't have to use such as large or xlarge just use 600dp of width. that is for >= 3.2 android os. its working expected in every device, but you may face issue in GALAXY series devices like GALAXY TAB-2, GRAND because they have old API at time you can use values-large & values-xlarge. this is device specific issue do only when required. one more note, create above layout multiple file as required like we have listview in layout then just create one file its same for all devices include tablets, like this way you can manage your app size also. LINEAR, RELATIVE and FRAME layout make you life easier. You can acheive this by designing layouts dynamically.It can fit for all screens.In Android We can't get conclusions on available mobile screens.There are lot of screens with different resolutions.In order to make UI has flexible.You need to design an layout dynamically. For example i added one xml which can fix for all screens(in portrait). Not the answer you're looking for? Browse other questions tagged android android-layout android-screen-support or ask your own question. What's “tools:context” in Android layout files? Android screen size and density. How to choose text size? Is there a way to create xxhdpi, xhdpi, hdpi, mdpi and ldpi drawables from a large scale image? How to define dimens.xml for every different screen size in android?